Just as a momentous Parliamentary session draws to a close, and with the silly season already in premature full swing, quarterly GDP figures of 1.1% are announced. Cue all manner of daft commentary. The most you can say about a freak result like this, is that it might, just give Osborne a soupçon more confidence as he goes about his intense summer assignment. But I like the thought of it throwing the Labour higher-ups (we can't dignify them with the term 'leadership') into a state of confusion. Does this mean they didn't deserve to lose the election, or is it a flash in the pan ? Can all of them now go flat out with 'we wouldn't have made cuts' ? But what about 'here comes the double-dip' ? Are the Libs doomed - or have they hitched their wagon to the right team ? In fact, I like the confusion that the Coalition creates on several fronts, domestic and overseas, friend and foe alike. Just so long as it gets the quiet nod from Mr Market which (looking around at Europe, the US or indeed just about anywhere else) seems pretty safe - for the time being. It all lets Cameron get on with being his own man. He gets it, they don't. He creates it, they are left scrabbling to figure it out, mostly through outdated frames of political reference. He surprises them daily. He looks like just the man to leave them on their backsides for years to come - and to know what to make of this opportunity. Hey, everything's changing ! Deal with it. And in the meantime, George and Danny soldier on with the real stuff. Mr Market's still watching. The thing is Nick, Cam talks s***e. "Big society" "Violent agreement" etc. At least Osborne, whether you agree with him or not, talks in plain English. Far from trying to figure Cameron out, I've pretty much stopped listening to him. Me too. I never did like his outlook, whilst accepting the fact that he would have difficulty being worse than Brown. Rather more importantly he is stuck on the establishment treadmill of membership of the EU (including lying or ignorance about how much the EU controls us), belief in CAGW, belief in a statist BBC and a lack of belief in his own country. I don't suppose he is any better than Alistair Darling. The ONS got themselves into the Condem's bad books by signing the contracts for the 2011 census days before the election. Now that are the bringers of surprise good news. Coincidence? A fair post disfigured by dumb comments. Millions had already been spent on the 2011 census anyway. When Kennedy said the same thing (and brought in voluntary service overseas he was hailed a genius. 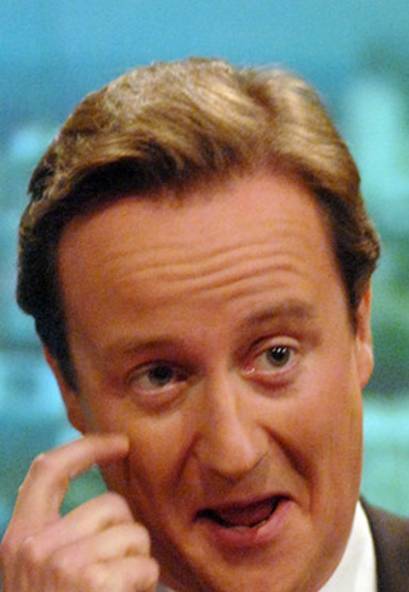 The mealy mouthed can only slag off Cameron. And Budgie just perverts the world to suit his prejudice. It's bull, Nick, as you know and I've just pointed out and the thought that this government is working for us is an illusion. How about withdrawal of Index-Linked Savings Certificates, for example? What do you make of Lord Levene's new float? I heard the old buffer's talking about their customer focus. "We will allow dogs in the banks. Why not? Its only for the benefit of the bank that they are forbidden." 2} They attack each other. Once the branches have had a few excited canines frightening the children and peeing up the counters and that policy will stop. trevorsden said: "And Budgie just perverts the world to suit his prejudice." What a brilliant comment, well supported by reasoned argument - I don't think. The EU is probably the most significant policy area in this country because it is the only body that can make new laws to be imposed on the entire UK, without reference to, and over riding, our supposed 'real' parliament. It is also extremely costly, as well as undermining our Common Law and our civil liberties. Cameron's policy on the EU is virtually identical to his predecessor's. CAGW, whether you believe in it or not, is pushed by the EU (whether we like it or not) and is one of the most expensive government programs ever. There are serious doubts about the integrity of CAGW 'science' and even more doubts about whether we either can, or should, ameliorate its affects. Cameron's policy on CAGW is virtually identical to his predecessor's, if not even more credulous. The BBC claims it is impartial. Frankly I have never met or seen any human being who is 'impartial'. We are fallible beings with limited experience and knowledge. It is, therefore, impossible that the BBC, run by humans, is impartial. But we do not need to accept such a non-statist philosphy. The BBC does it for us because its line on CAGW, the EU, abortion, etc, is entirely predictable and roughly in line with the Grauniad. Even though Cameron is damaged by the BBC, he won't do the obvious thing and sell it off. He is wedded to a state broadcaster. Cameron's policy on the BBC is in principle the same as his predecessor's. Cameron is worse than useless, he has beguiled right of centre voters in the same way that Blair beguiled left of centre people. Cameron is therefore either impossibly ignorant or a cheat and liar, just like his three predecessors. We suffer from too much government all of it bloatedly extravagant and wasteful, virtually none of it consistently delivering meaningful results. The European Union is a busted flush, it is now a political ideology, propped up to keep the gravy train/power brokers going. Every Eurozone country has diminished it's standard of living whilst those outside of both the Eurozone and indeed the EU are riding high. Even after all its recent troubles Iceland still has the 3rd best standard of living in the World behind those other two EFTA countries Norway and Switzerland. Dave is another in a long line of sound bite politicians. We are going to spend a few billion "scrapping" quango's and then resurrecting them with different names. In fact just like the last lot . I am slightly less gloomy than Budgie and Libertarian (maybe I'm rather niaive or still in the honeymoon period). Maybe our EU membership and associated costs is for later after beginning to tackle some of our more pressing problems over which we may have some control. Extricating ourselves from some/all of the EU will be more difficult than things we can do at home. I thank god daily that we are not in the Euro. At least we have some control of our currency. Does anyone know of a decent article (and a link to it) critically appraising these GDP figures?